Tourists brave terrifying hiking the treacherous Chang Kong Cliff Road on the edge of China’s Huashan mountain. Made of wooden boards just wide enough for a footstep, the ‘path’ is crudely nailed together and some sections are in desperate need of repair. Conditions are even worse during the winter months, when hiking is still permitted. 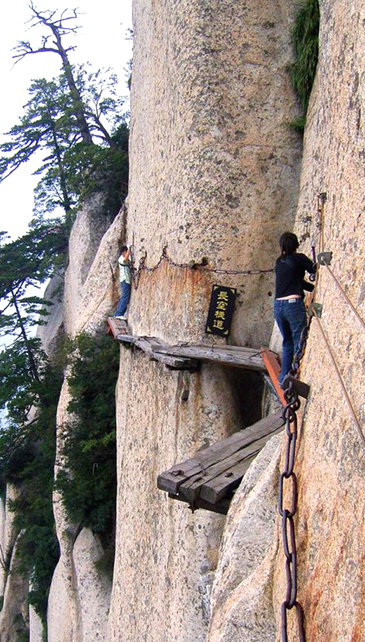 With only a harness around their shoulders, tourists dressed casually in jeans and trainers cling to safety chains as they creep along the rock face in Shaanxi province. Despite the dangers, the route is popular with tourists and monks alike as it is seen as a holy place – and besides, it has views to die for. The road is believed to have been built more than 700 years ago by hermits seeking ‘immortals’ they thought were living high up in the mountains. Huashan has a variety of temples on its slopes but it also has its fair share of hawker stalls to revive the spirits of the odd shell-shocked hiker.